Watch this space for exciting news about upcoming speakers! UPDATE, 5 PM Alas, our speaker called in sick! We’re working on getting a sub to talk about the latest news on black holes, including the recently announced first-ever imaging of one. And we’ll reschedule Tim as soon as he’s better. Apologies from Tim and the club for the last-minute change. Here comes one of our all-time favorite speakers, retired JPL physicist Tim Thompson, who’ll cover “Oumuamua, Interstellar Visitor.” Tim’s ability to convey a sweeping range of complex information in an intuitive, entertaining way is unparalleled, though not unparallaxed, unless perhaps you look at him with one eye closed. Check out Tim’s website here and do not miss learning the latest on the swirling debate over whether asteroid Oumuamua is of natural or, as Harvard astrophysicist Avi Loeb has suggested, perhaps artificial origins. FRIDAY, February 8, 2019: Our special guest was Martin Kvitky, an engineer/manager who retired in 2012 after 51 years in the aerospace world. Martin’s career started in 1961 at North American Aviation, Autonetics Division. (Autonetics was responsible for building the inertial navigation system for the intercontinental ballistic missiles [ICBM], aka Minuteman.) In 1963 Martin transferred to North American Aviation, Space and Information Systems, working primarily on the Apollo program and secondarily on the Saturn program at the Seal Beach facility. Martin also worked in the Primary/Secondary Standards lab responsible for maintaining equipment used to test peculiar ground support equipment (PGSE). PGSE was used to test the Apollo command and service modules built in Downey. FRIDAY, January 11, 2019: We’re happy to announce a great start to the new year with this month’s talk, “Implications of Interstellar Asteroids,” by geologist Patrick Gisler. A friend of SMAAC member Gary Smolker, Patrick wrote a paper about ultra-high velocity interstellar objects that Gary shared for members to read, and now we’re lucky enough to hear him in person. Gary, thank you very much for introducing Patrick to our club! We really appreciate it. FRIDAY, December 14, 2018: Let’s give a warm welcome to Jason Utas, graduate student in the Geology Department at UCLA, who will arrive bearing specimens of … drum roll please … meteorites! So you may not be surprised to learn that the title of his talk is “Meteorites,” but you will most likely have a fun, informative time if you join us. The parking lot may be a little more crowded than usual; don’t worry, there’s plenty of space on the streets nearby. Neil Armstrong, world legend, American hero, and subject of the film (in theaters now) First Man, in a presentation called “Journey to Tranquility Base.” All are welcome! FRIDAY, October 12, 2018: This month’s meeting brings us Krista Sawchuck, graduate student in the Geology Department at UCLA. Her talk will be “Planetary Interiors: What we know about the inside of Earth.” Don’t miss it — come on down! FRIDAY, September 14, 2018: We welcomed JPL’s Steve Levin, a research scientist who’s won awards for his work on the Juno Team, which supports the awesome Juno mission to Jupiter. What a thrill to hear the latest developments firsthand! More on Steve here (click to read). FRIDAY, August 10, 2018: Our next meeting features Carla Quintero, currently studying high-velocity quasar outflows at Humboldt State University. Carla’s talk, “Quasars and Their Extreme Outflows,” is sure to fascinate. All are welcome! Click here to read more in this month’s not-to-be-missed bulletin…. **NOTE ATYPICAL DATE** FRIDAY, JULY 27, 2018: The July meeting was moved to Friday, July 27, at the usual 7pm starting time. Our speaker was the amazing Timothy Thompson, who spent many years at JPL. Tim discussed the remarkable discovery, by LIGO, of the gravitational waves from two merging neutron stars, along with the major implications of all of this spectacular scientific work. FRIDAY, June 8, 2018: Among other things, we featured a short film by our very own club member and budding filmmaker Blake Simon. This was, without a doubt, a “world astronomy club premiere.” We didn’t have Hollywood celebrities, limos, or a red carpet … but we did have a good time, as always. FRIDAY, May 11, 2018: Star party (weather permitting) — rooftop telescope observation, plus whatever news updates, special topics, or book reviews our members want to share…. Dr. Earl H. Maize from the Jet Propulsion Lab spoke about the Cassini-Huygens Mission to Saturn, the landmark mission that has given us a new window on that magnificent world. How was this mission put together? What did it take to design and build a spacecraft of a size and complexity that far surpassed previous missions? How did it accomplish its scientific goals? What’s the story behind the breathtaking images and astounding discoveries? Dr. Maize was Program Manager for the Cassini Mission, and is a speaker in great demand — this was a great opportunity to hear firsthand about the amazing project that has brought new worlds to our doorstep. More about the talk PLUS astronomy news of the month in April’s newsletter (click here to enjoy)! Hi, all. We’ll be meeting Friday, March 9, at 7 pm at Wildwood for an exciting talk by aerospace engineer Jim Bartlett about his visit to astronomical facilities in Australia, and about new developments on the ever-changing spaceflight scene. Jim has worked on many fascinating projects, including the Space Shuttle main engines. He’s a longtime SMAAC member, and we’re very thankful that he also serves on the club’s board of directors. Spaceflight is in the news in a big way these days, so this month’s talk will touch on several hot topics. We’ll also have updates on astronomical events and happenings — don’t miss this one! Our free talk on Friday will feature Dr. Kevin Barnes of JPL speaking on extraterrestrial water and the possibilities of life beyond earth. You’ve heard about the discovery of liquid water on Mars. But did you know that Enceladus, a small moon of Saturn, has geysers that spout liquid water into space contributing to the formation of one of Saturn’s rings? That Titan, Saturn’s largest moon, has both lakes of methane/ethane and an ocean of water deep below its surface? That NASA’s forthcoming Europa mission will probe that icy moon’s sub-surface water ocean for signs of primitive life? In this talk, Dr Kevin Baines “follows the water” to describe what planetary scientists are learning about the role of water in the atmospheres and ocean worlds of our solar system. Dr. Kevin Baines received a BA in Physics and Astronomy from Amherst College in 1976. He obtained a PhD from Washington University in St. Louis, Missouri in 1982 in Physics, developing and publishing the most sophisticated models of the planet Uranus then in existence, based on telescopic observations. Since 1982, he has been a planetary scientist at the Jet Propulsion Laboratory in Pasadena, CA. CLICK HERE for more details in this month’s bulletin (or browse previous ones). It’s a must-read, as always: You’ll find more information about the program, plus coverage of SpaceX’s wildly successful Falcon Heavy launch, and the search for moons and rings around nearby star Beta Pictoris B. Thanks to Jed for the bulletin, as always, and to Mona, for helping secure another superb speaker! STAR PARTY TO OBSERVE TOTAL LUNAR ECLIPSE! The Santa Monica Amateur Astronomy Club is hosting a star party at the Wildwood School (our regular meeting site) to observe the first total lunar eclipse in over two years. Gathering at 4:30 AM — yeah, you read it right…. Bring your telescope if you like, or use ours! Our talk Friday, Jan 12, 2018 was on “Cassini’s Grand Finale.” Cassini went out with a great ‘splash’ in September, marking the end of a landmark mission — or was it the end? The discoveries are still making headlines, and more are surely to come. Our speaker was JPL’s Dr. Bonnie Buratti. You may have seen her interviewed recently, or even have one of her wonderful books. This will be another great talk in our series, so please join us at 7 PM this Friday. Please CLICK HERE to take a look at this month’s bulletin (you can also browse previous ones). It has more information about the program, plus very interesting news about Saturn’s rings, the great gravitational wave “event of the year,” the most massive stars — and also the upcoming total lunar eclipse. Dr. Bonnie Buratti is a Principal Scientist and technical manager at NASA’s Jet Propulsion Laboratory in Pasadena, California, with expertise on the structure and evolution of icy moons and other small bodies. She holds degrees from MIT and Cornell in Astronomy. She is currently serving on the Science Teams for both the Cassini and New Horizons missions, and she is also the NASA Project Scientist for the Rosetta Mission to a comet. The author or coauthor of over 200 scientific papers, Dr. Buratti was awarded the NASA Exceptional Achievement Medal, and the International Astronomical Union recognized her work by naming asteroid 90502 Buratti after her. She is a Fellow of the American Geophysical Union. Her newest book, Worlds Fantastic, Worlds Familiar: A guided tour of the Solar System, was published in 2017. Thanks to Mona for arranging this month’s program! Our speaker for Friday, December 8, 2017 was Dr. Jeffrey Rich, a research astronomer at the Carnegie Observatories. 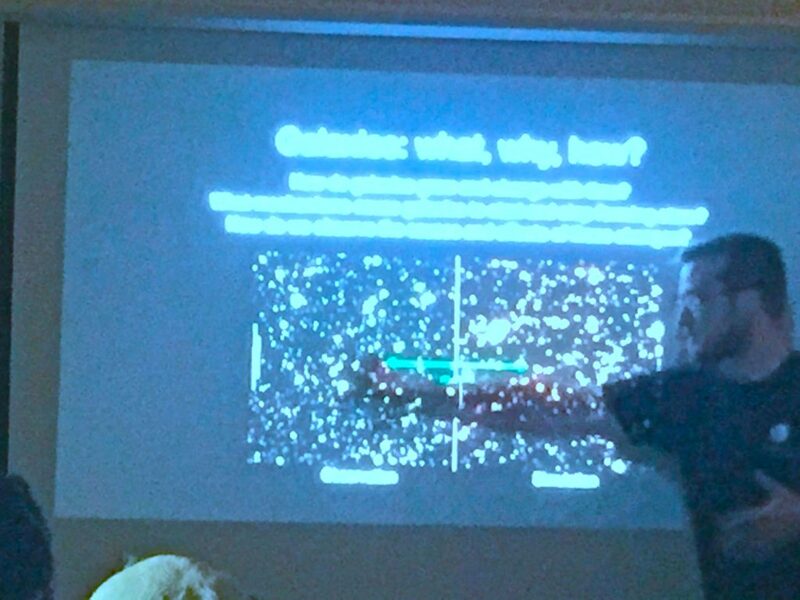 Dr. Rich, who was a postdoctoral fellow at Caltech before arriving at Carnegie, talked about his work on ULGs — ultraluminous galaxies. These exceptionally bright infrared sources, powered by bursts of star formation as well as by active black holes, may represent cosmic collisions on a grand scale, and might reveal to us how quasars and elliptical galaxies form. Cutting-edge astronomy, deep in the Realm of the Nebulae. Our own fantastic speaker Jed Laderman speaks on the weighty (or should we say massy?) matter of … dark matter. Dr. Terese Hansen of the Carnegie Observatories speaks on the chemical evolution of the Milky Way. Members share their eclipse-viewing stories and photos — several traveled to the path of totality and will report back! Tim Thompson, formerly with JPL, will give us an “encore talk” on “A Universe of Galaxies” beyond our home in the Milky Way! Mt. Wilson Observatory is the birthplace of modern astronomy, astrophysics and cosmology, and arguably the most significant observatory in the history of astronomy. Our guest speaker, Tim Thompson, has been associated with Mt. Wilson Observatory since 1981. Tim also worked at JPL for many years, specializing in planetary atmospheres and infrared astronomy. Tim will present a fascinating talk on the history and current status of Mt. Wilson Observatory and its unique status in the field of astronomy — come on down! “The Analemma” and other neat demonstrations! Plans for the coming year… DIY astronomy… and a tribute. Holiday Party! Please bring any edibles you would like to share. We’ll also have some astronomy posters and books to give away. Updates on a whirlwind of big news stories. Your guide to upcoming astronomy events! A busy month for astronomy in L.A.
Human Space Flight: What’s Next? There has been a lot of talk and speculation about what the next goal for human space flight should be. Some, like Elon Musk say Mars should be the goal. Others have talked about going to an asteroid. Some few hold out for returning to the Moon. Let’s look at the options. What are the hurdles to each of these efforts versus the rewards? Be ready to examine the evidence and discuss your favorite proposal. Speaker: Our very own Doug Saxon, PhD in History from UCLA, Retired LAUSD teacher. Currently teaching at West Los Angeles College. Former Fulbright-Hays fellow and Social Science Research Council Fellow. Trina Ray, of JPL, will be speaking on “Cassini at Enceladus.” One of the great discoveries of the Cassini Mission, the icy jets emerging from Enceladus make this small satellite a prime target in the search for life beyond the earth. invisible colors, as well as the telescopes used to reveal them. This meeting is yours—updates, discussion, astronomy talk, planning, Q and A…it’s your call this time around! Mt. Wilson, RECON updates, and more! We’ll hear about the past, present and future of Mt. Wilson at this month’s meeting, as our club makes plans to be a part of the scene at one of history’s greatest astronomical sites. April 2016 meeting changed from the 8th to the 15th. We’ll be back to our usual second Friday time slot for all subsequent months this year. We’ll be hearing from our club members on a variety of topics this Friday, including results from a recently published planetary paper, and updates on RECON! Hope to see you at 7:30 on the 15th! Women have been at the forefront of many an astronomical discovery, though we may not have been informed about them…. In Friday’s talk we’ll hear about some particularly notable contributions to our understanding of the universe. Also, there will be updates on the brightest supernova ever seen, quantum entanglement, and other astronomical news, as well as our new club endeavors. Eclipse Science — and Travel! Our speaker for Friday, Matt Ventimiglia of Griffith Observatory, will tell us about the science of eclipses –historical observations, how often they occur, how we predict them — and he’ll talk about the pleasures of eclipse travel. Matt, who has seen 10 total solar eclipses himself, will highlight some upcoming ones, including the August 2017 eclipse that’s starting to generate a lot of excitement here, and he’ll give us pointers on observing them safely. Meeting starts at 7:30 pm! Telescope viewing, weather permitting, and a talk on winter sky objects!